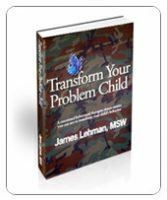 This week, read about an oppositional, defiant teen in James Lehman’s compelling new book, Transform Your Problem Child. Meet the parents and family of Caleb, who have been dealing with their son’s behavior since he was a young child, and “raising their tolerance for deviance” with each instance of acting out. When Caleb gets physically abusive, his parents go to see James—and are finally given real solutions to his behavior– even if those solutions are not what they expected. For parents of children with Oppositional Defiant Disorder, every day is like living in a war zone. Seemingly simple requests set off “land mines” with these children because they have a marked inability to hear the word “no” and a determination to gain power in the home through constant arguing. The story of Caleb offers insight for parents of any child who is oppositional, whether diagnosed with a disorder or not. In this story, you will learn how to address bullying and physical violence against siblings, refusal to follow rules and take responsibility, stealing, cursing and manipulative and threatening behavior. Every day was a struggle to get him to school. From the start, Caleb hated the bus, and in the first years of elementary school he’d protest and complain so much that Monique often ended up driving him to school. But on the days she opened the women’s clothing store she owned, she didn’t have the time to do this. Neither did Ben, whose work kept him on the road or in an airport much of the time. So she would beg and plead as they waited at the stop, Caleb declaring that he wouldn’t get on the bus and Monique feeling the stares of the other mothers. When the bus arrived, he wouldn’t budge. Monique’s pleas would turn to demands, still to no avail, and the driver would tap his foot impatiently as she grew more and more flustered. Finally, fighting back tears, she would drag Caleb onto the bus, kicking and screaming. She knew the entire neighborhood was talking behind her back: What is wrong with that kid? What’s wrong with that mother? By the time Caleb hit third grade, the bus was a moot point—he’d made so much trouble that he got kicked off it indefinitely. Monique adjusted her work schedule so she could drive him to school and back. Dropping him off or picking him up, she avoided meeting anyone’s gaze in the playground. She knew what everyone was thinking. She has to drive her son because he’s so out of control. It was all so humiliating. And lonely. She couldn’t talk to her friends or even her family about it. Every time she brought up his latest behavioral incidents they’d tell her she needed to put her foot down. Nobody understood what it was like to parent a child like Caleb, so she just stopped bringing it up to anyone. Caleb took great pleasure in embarrassing his sisters. The sibling rivalry increased as he got older. Caleb never knew when to stop. “Why is he so mean to me?” Stephanie asked. Monique wished she knew the answer, but she was just as mystified. The sacrifices they all had to make were enormous. Caleb’s behavior made playdates for the girls impossible. The family was always turning down invitations to the zoo, family outings to the beach, block parties. It wasn’t fair that her two daughters had to miss out on so much, but she didn’t know the solution. She hoped that one day they would forgive her for being such a horrible mother. She hoped one day she’d forgive herself. explosions if they gave him what he wanted most of the time. blackmail her, saying that if she lies for him he’ll grant her “immunity” for a week or so at a time. Caleb has broken the door to his own room so many times Ben took it off its hinges. He has punched holes in his bedroom walls and threatened to key the family car if he wasn’t allowed to drive it. Monique feels she’s on an endless loop of scuffles with him. And he’s got a foul mouth. She tried to reason with him once about why he shouldn’t keep his music on full blast. “You’re bothering everyone in the house,” she said calmly. “Yeah, well they bother me,” he replied. She had just about given up, deciding that she couldn’t do anything about him, when he went too far with the girls. Monique hated to leave the kids alone in the house, but one day after running late at the store, she came home to find Stephanie and Lauren screaming and crying. “What happened?” Monique said as she threw her keys on the hallway table. “Caleb hit me with a sneaker!” Stephanie said, her face beet red from crying. The three of them walked to the kitchen, the girls still crying. “Back up and start from the beginning,” Monique said. “He never lets us use it,” said Lauren fiercely. Leaving Lauren holding the ice to Stephanie’s face, Monique marched into the den. Caleb kept his eyes on the computer. “Be quiet, I can’t concentrate,” said Caleb. “That’s it! I’ve had it with you. Go to your room!” Monique yelled. “And what are you going to do to me if I don’t?” Caleb smirked. She had no idea what her next move would be if he didn’t obey her, and she prayed that he would. Caleb stood up and yelled “B****!” as he went off to his room. Monique collapsed onto the couch, shaken from the standoff with her son. Mortified at the thought that her daughters had witnessed her so overtaken. Tired and empty from years of arguing with a kid—now a young man—who lived to defy her every word. “Don’t cry, Mom,” Stephanie said as she and Lauren crept into the room. “Everything will be okay,” Lauren added. Monique realized the family roles had somehow been reversed. Her daughters were trying to take care of her, not the other way around. She hugged her girls, not wanting to let them go. I need to protect them, she thought. I can’t let this go on any longer. Monique’s demeanor began to crumble. “Difficult doesn’t even begin to describe it, James. I love Caleb, really, I do. But….but…I can’t stand being around him. I know that’s a terrible thing to say. What kind of a mother says that she can’t stand being around her child? What is wrong with me?” she sobbed, as Ben put his arm around her. “Monique, you are the mother of a child with a very difficult personality. It’s tough to feel close to a child whose primary mode of communication is hostility, antagonism, and resistance,” I said. “So is it hopeless?” Monique asked, reaching for the box of tissues I offered her. “You’ve pretty much summed up our son,” Ben said, cracking a rueful smile. “Police?” Monique asked, clearly shocked. When they got home, Monique and Ben went into Caleb’s room. They sat on his bed and told him they needed to speak with him. “This is my room, I’ll invite you in when I want you here,” Caleb said. “No, Caleb, this is our house, and technically it’s our room,” Ben countered. “Whatever,” he said, rolling his eyes. “Like hell I’ll go anywhere with you,” Caleb said. “Yeah, right. You wouldn’t call the police. I dare you,” Caleb snickered. “Fine, then. I’ll leave!” Caleb yelled and he walked out of the room. Ben and Monique followed him while Caleb continued to swear. Ben found himself turning up the volume of his own voice to try to drown out the swearing. Caleb screamed, “Leave me alone!” Then he grabbed a bowl off the coffee table and threw it at them. “That’s it,” Ben said and he went to the phone to call the police. When they arrived a few minutes later, Caleb was screaming at his parents to leave him alone. “You can’t do anything to me!” he yelled. Ben filled the police in, and the officers took Caleb aside. They told him he had to do what his parents wanted or they could press charges. “Fine, I’ll go to your f**king therapist,” Caleb finally relented. He spent the rest of the night in his room. Caleb came to see me the next week. When children with ODD are confronted with a problem they can’t solve, they react emotionally and that’s when the trouble starts. So one of my goals was to show Caleb that his solution wasn’t working to solve the problem. We talked about what happened with his sister. “She was being a brat,” he told me. Monique, Ben, and Caleb continued to see me for six more months and put in six months of hard work. They began a reward system that allowed Caleb to earn extras for making the right choices. Eventually he earned his own computer in his room. Caleb is about to graduate from high school (just barely), and he’s planning to look for a job and get a car. Monique and Ben have told him that if he continues on the right track, he can stay in the house. Monique realizes that Caleb is still a challenge and probably will always be, but these days, she feels like she’s up to it. Although she knows the war is not over, she hopes it is at a cease-fire. Read how James helps Caleb and his parents in Transform Your Problem Child. In the book, James shares stories based on thirty years of working with parents to manage behaviors ranging from back talk and lying to outbursts caused by ADHD and Oppositional Defiant Disorder. Known for his no-nonsense, practical approach, James Lehman shows you step-by-step ways to manage seemingly unmanageable child behaviors and bring peace and sanity back to your home.